Due to existing application gap, the diverse microorganisms and their processes in food waste have not been maximally explored or harnessed. This chapter addresses the possible application of “-omics” technologies to understand food waste microbial composition and metabolic processes, to stimulate future research in mining food waste for important microorganisms and bioactive compounds. The chapter highlights potential “-omics” procedures for food waste assessments. These innovative, culture-independent, high-throughput technologies have already revolutionized diverse fields of research and human endeavors. This chapter also introduces the concept of food wastomics to detect, identify, and measure the different molecules and microorganisms that are present and expressed in food waste such as DNA, RNA, proteins, lipids, and metabolites. This knowledge will create a greater understanding of how discarded food is degraded and what useful products or organisms may be harvested from it. Finally, the chapter recommends the integration of food wastomics into foodomics. Food is any substance, whether liquid, concentrated, solid, semi-solid, frozen, dried or dehydrated excluding alcoholic beverages, dietary supplements, soft drinks or tobacco that are prepared or sold for ingestion or chewing by humans and other animals for their taste or nutritional value (ODT, 2004). Besides taste and nutrition, food is also a socio-economic vehicle for distinction and establishing links as well as other symbolic, psychological, physiological, moral, environmental and cultural expressions (Rozin, 2005; Stajcic, 2013). Different methods have evolved for food production, packaging, consumption and storage depending on the nature of the food. Food is an essential part of animal and human lives as it provides the energy required to fulfil daily obligations in good health and for survival. There is a global target to make food available, easily accessible, and inexpensive despite current food insecurities. Food security is when in the absence of hunger, the population have physical and economic access to sufficient, safe and nutritious food for an active and healthy life at all times (FAO, 2001). According to Shi (2014), food security is a multidimensional challenge embedding social, economic and environmental complexities that require an examination of gaps within agricultural and socio-economic systems. Global food security goals seek to significantly increase agricultural productivity and food supply, minimize the secondary use of food crop as biofuels, reduce food loss and waste, ensure efficient distribution of food, eliminate hunger and malnutrition, produce nutritious food and make food production systems more resilient. Among other factors, food loss and waste (FLW) have a negative influence on food security and global development goal. Food loss is the decrease in the quality and quantity of nutritional, economic and food safety value of food whereas food waste occurs when the entire or a part of safe and nutritious food is discarded or subjected to alternative (non-food) use (FAO, 2014). In both cases, food suitable for human consumption is not eaten and can occur at any point within the food systems (i.e. production, packaging, distribution, consumption and storage). Food loss may be accidental due to inadequate technology, lack of knowledge and skills, poor logistics and malfunctioning markets, whereas food waste is considered the outcome of an intended or unintended behaviour such as the deliberate removal of food by choice or negligence (FAO, 2017). Leach and Swannell (2017) opined that the FAO’s definition is vague because of the emphasis on loss and waste resulting from food that is fit for consumption, citing chicken feet, which are eaten in some part of the world and not in others. 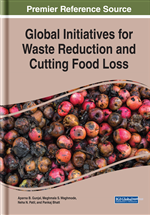 Moreover, the definition has ambiguous connotations when considered with the International Food Waste and Loss Standard for evaluating FLW as outlined in FLWP (2016) wherein a detailed sustainable approach for measuring food waste and loss is outlined. Nonetheless, the main drawback of this multi-organization collaboration is insufficient information at various levels. HLPE (2014) rightly considered FLW as an integral part of the food system and the consequences of associated functions and techniques.